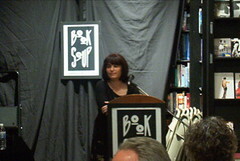 Kim gave a reading at Book Soup Wednesday night for her latest book, Neutral Milk Hotel’s in the Aeroplane over the Sea, another in Continuum Press’s 33 1/3 series. Fans turned out in force seeking camaraderie and moral support in what a few described as their “secret passion” for this enigmatic album and band/music collective. A podcast of some of the more notable confessions of NMH fans coming soon.